After a good bit of sightseeing in Ghent, I decided to have a late lunch at T’Vosken. I was looking for a restaurant where I could enjoy a bowl of waterzooi, a Belgian dish that I had been reading about which originated in Ghent. After reading several favorable reviews on Trip Advisor, this seemed like an appropriate place to rest up and recharge with a glass of wine and some local cuisine. 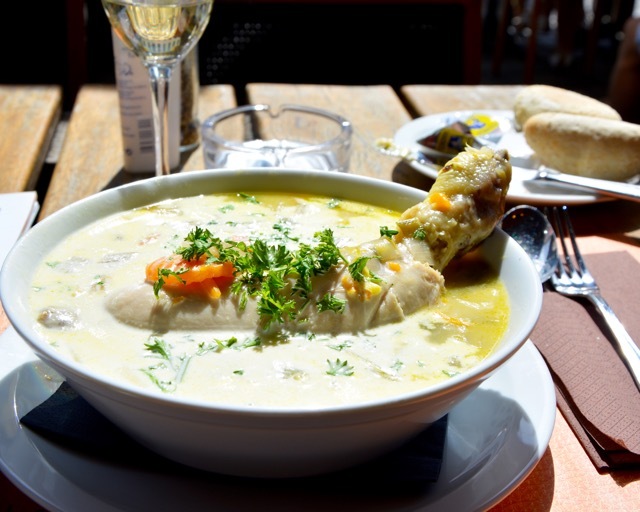 I ordered the Gentse Waterzooi (Waterzooi of Ghent). It’s a dish that is something between a chicken stew and chicken soup. It’s slightly thickened with cream and egg yolk, and loaded with carrots, leeks, celery and a few hearty potatoes. The vegetables added lots of texture, flavor and color to what would otherwise be a visually boring yellow and beige dish. The main component of the dish was whole chicken leg quarter, which sat beneath a scattering of beautiful, bright-green parsley in the center of the satiny yellow broth. Admittedly, the leg quarter was difficult to eat with a knife and fork, as would most chicken on the bone, especially in a bowl of hot broth — which is not meant to be critical, especially since there were generous portions of boneless chicken breast in my bowl as well. Overall the dish was very good, especially after adding a bit of salt to sharpen its flavor. The price points for entrées were on the high side, though I find this typical for any tourist-saturated city center. Fortunately, the wines were reasonably priced. The ambiance on the patio was pleasant, great for people watching, and after lunch or dinner you can walk over to visit the cathedral, which is breathtakingly beautiful on the inside (the outside was under renovations during my visit), or stop into any of the wonderful chocolatiers for a sweet treat. I would recommend Van Hoorebeke’s, which is just a few doors down.